The independence of the USACE contracting process was severely compromised. The Office of the Secretary of Defense (OSD) controlled “every aspect of the RIO contract,” even after responsibility for the contract was delegated to the US Army. She questioned why the Defense Department had delegated executive agency authority for the RIO contract to the Corps when it has no competencies related to oil production. Such work was outside the scope of its congressionally-mandated mission. Entity Tags: Bunnatine H. Greenhouse, Democratic Policy Committee, US Army Corps of Engineers, Halliburton, Inc. Entity Tags: US Army Corps of Engineers, Bunnatine H. Greenhouse, Halliburton, Inc.
Rumsfeld then shifts gears to visit one of Galloway’s favorite topics: the question of whether the US Army is broken. Far from being in poor shape, Rumsfeld asserts, the Army is “light years better than it was four years ago.” Galloway counters that Rumsfeld’s strategies are nonsensical if they result in Army and Marine soldiers being sent in endless forays down the same highways to die by roadside bombs. The US is playing to the insurgency’s strong suit, Galloway argues. Rumsfeld agrees, and says he has instructed the US commander in Iraq, General George Casey, to shift the focus from patrolling to “standing up” the Iraqi defense forces. He has told Iraq’s leaders that the US is losing the stomach for the ever-growing casualty count, “and they understand that and agree with it.” Galloway parries Rumsfeld’s talk with a question about the Army sending bill collectors after wounded soldiers who lost limbs in a bombing, or were “overpaid” for combat duty and benefits. Rumsfeld blames the Pentagon’s computer system, and says the problem is being addressed. Rumsfeld agrees with one of Galloway’s columns that lambasted the Pentagon for doing enemy body counts. “We are NOT going to do body counts,” Rumsfeld asserts. Galloway retorts that the Pentagon is indeed doing body counts and releasing them, and has been doing so for a year. If you don’t want to do body counts, Galloway says, then stop doing them. Mishandling of Intelligence - Murtha joins with other Democrats in accusing the administration of deliberately misrepresenting intelligence about Iraq’s WMD and its connections to al-Qaeda. Vice President Cheney has called such accusations “dishonest and reprehensible.” President Bush responds: “I expect there to be criticism. But when Democrats say that I deliberately misled the Congress and the people, that’s irresponsible. They looked at the same intelligence I did, and they voted—many of them voted—to support the decision I made.… So I agree with the vice president.” Asked about the comments, Murtha retorts, “I like guys who got five deferments and [have] never been there and send people to war, and then don’t like to hear suggestions about what needs to be done.” Cheney received five deferments during the Vietnam War which allowed him to sit out the war; Bush was a Texas Air National Guardsman who did not leave the country during that war. 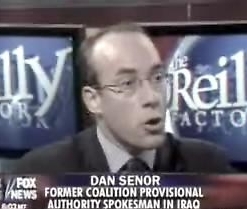 Other Democrats say that they were themselves misled about the intelligence on Iraq’s WMD. 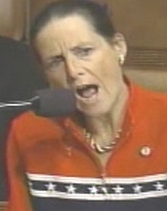 Jean Schmidt making her statement on the floor of the House. [Source: Pensito Review]Representative Jean Schmidt (R-OH) accuses fellow Representative John Murtha (D-PA) of cowardice. 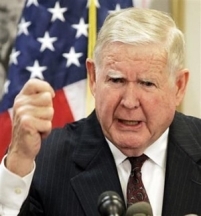 Murtha, an ex-Marine, decorated Vietnam veteran, and longtime military supporter, has called for US troops to be withdrawn from Iraq as soon as possible (see November 17, 2005) and November 17, 2005). Schmidt says she is merely quoting the words of a constituent when she says on the floor of the House: “Yesterday I stood at Arlington National Cemetery attending the funeral of a young Marine in my district. He believed in what we were doing is the right thing and had the courage to lay his life on the line to do it. A few minutes ago I received a call from Colonel Danny Bubp, Ohio representative from the 88th district in the House of Representatives. He asked me to send Congress a message: Stay the course. He also asked me to send Congressman Murtha a message, that cowards cut and run, Marines never do. Danny and the rest of America and the world want the assurance from this body—that we will see this through.” Democrats, appalled by Schmidt’s words, boo and shout her down; Democrat Harold Ford (D-TN) charges across the chamber’s center aisle and shouts that Schmidt’s attack is unwarranted. Democrat Martin Meehan (D-MA) shouts: “You guys are pathetic! Pathetic.” The conflict comes during a debate over a Republican “stunt resolution” that calls for the immediate, unconditional withdrawal of all troops from Iraq (see November 18, 2005). The Golden Mosque, before and after the bombing. [Source: Associated Press] (click image to enlarge)The Al-Askari or Golden Mosque, in Samarra, Iraq, is partially destroyed in a bombing attack that devastates the ancient shrine. The mosque is one of the holiest of Shi’ite sites. 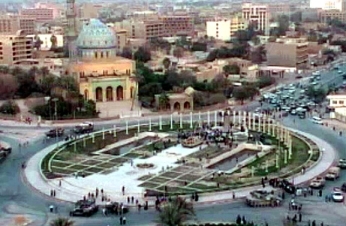 The attacks are carried out by about a dozen men in paramilitary uniforms who enter the shrine, handcuff four guards sleeping in a back room, place a bomb in the dome of the mosque, and detonate it. [New York Times, 2/22/2006; Radio Free Europe, 2/12/2007] The devastating attack on one of Shi’a Islam’s holiest sites prompts off a wave of Shi’ite attacks on Sunni mosques, Sunni citizens, and even US occupiers that eventually takes over 10,000 Iraqi lives and brings the country closer to full-blown civil war. [Washington Post, 6/13/2004] Some local officials say that the bombers wore the uniforms of Iraqi security forces. Iraqi Prime Minister Ibrahim al-Jaafari says that the attack was possibly the result of “infiltration” of Iraqi security forces. The four guards found handcuffed will later be arrested as suspects in the bombing as well as 10 men dressed as Iraqi police commandos. [Washington Post, 2/23/2006] The Iraqi government will blame the al-Qaeda faction in Iraq for the bombings, though that organization’s responsibility for the bombings remains unclear. [Reuters, 6/13/2007] One leading Iraqi Shi’ite politician, Abdul Aziz al-Hakim, lays partial blame for the bombing on the US ambassador to Iraq, Zalmay Khalilzad, saying that Khalilzad’s public comments on death squads operating within Iraq’s Shi’ite-led Interior Ministry were a provocation to the bombing. [New York Times, 2/22/2006] Shi’ite and Sunni politicians exchange accusations over the bombings, with Shi’ite lawmakers saying that the government ignored warnings about the attacks, and Sunnis accusing Shi’ites of bombing their own shrine to exacerbate discords between the two religious factions. [Reuters, 3/2/2006] President Bush promises to rebuild the mosque. [CNN News, 2/22/2006] But the shrine is, as of mid-2007, never rebuilt, partly because of disagreements between Sunnis and Shi’ites as to how to go about the rebuilding process. [Radio Free Europe, 2/12/2007] The shrine will be bombed again 17 months later (see June 13, 2007), setting off another wave of violent reprisals. 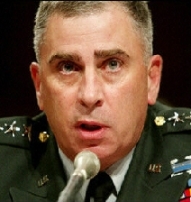 Retired Marine Lieutenant General Gregory Newbold, until October 2002 the director of operations for the Joint Chiefs of Staff, is another in a small but vocal group of current and retired generals voicing public dissent against the Bush administration’s policies in Iraq. Newbold writes an op-ed for Time magazine, and leads off by saying that after Vietnam, he and other career military officers determined never again to “stand by quietly while those ignorant of and casual about war lead us into another one and then mismanage the conduct of it.” But, Newbold writes, it happened again. He takes responsibility for his own actions in planning for the invasion of Iraq, but notes that “[i]nside the military family, I made no secret of my view that the zealots’ rationale for war made no sense. And I think I was outspoken enough to make those senior to me uncomfortable. 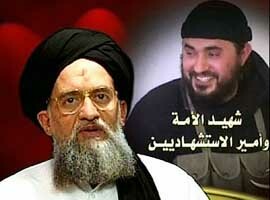 But I now regret that I did not more openly challenge those who were determined to invade a country whose actions were peripheral to the real threat—al-Qaeda.” Newbold retired from the military in late 2002, “in part because of my opposition to those who had used 9/11’s tragedy to hijack our security policy. Until now, I have resisted speaking out in public. 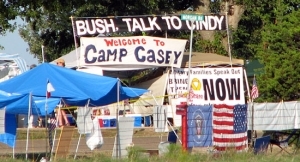 I’ve been silent long enough.” The cost of the Bush administration’s “flawed leadership continues to be paid in blood,” he writes, and that blood debt drives him to speak out. 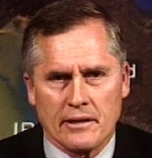 Outrage - Newbold writes of his deep anger at the words of Secretary of State Condoleezza Rice, who recently said that “we” made the “right strategic decisions,” but made thousands of “tactical errors” (see March 31-April 1, 2006). Newbold calls that statement “an outrage. It reflects an effort to obscure gross errors in strategy by shifting the blame for failure to those who have been resolute in fighting. The truth is, our forces are successful in spite of the strategic guidance they receive, not because of it.” Instead, he writes: “What we are living with now is the consequences of successive policy failures.… My sincere view is that the commitment of our forces to this fight was done with a casualness and swagger that are the special province of those who have never had to execute these missions—or bury the results.” Many of the Pentagon’s highest-ranking generals bear their own blame, Newbold writes, in “act[ing] timidly when their voices urgently needed to be heard. When they knew the plan was flawed, saw intelligence distorted to justify a rationale for war, or witnessed arrogant micromanagement that at times crippled the military’s effectiveness, many leaders who wore the uniform chose inaction.” Some few actually believed the rationale for war, others were intimidated, and many believed that their sense of duty and obedience precluded their speaking out. 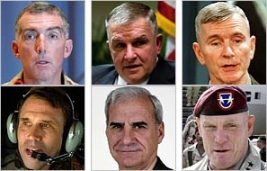 “The consequence of the military’s quiescence was that a fundamentally flawed plan was executed for an invented war, while pursuing the real enemy, al-Qaeda, became a secondary effort.” Many members of Congress, both Republicans and Democrats, “defaulted in fulfilling their constitutional responsibility for oversight.” Many media reporters, editors, and pundits ignored the warnings and instead played up the rationale for war. CNN’s Wolf Blitzer interviews one of its military analysts, retired Army General James “Spider” Marks. Blitzer asks Marks if Defense Secretary Donald Rumsfeld ever rejected “recommendations from military commanders for more troops.” Marks replies: “Sure. Oh, absolutely. I mean, that’s been documented if you read General [Tommy] Franks’s book [American Soldier], and the current book, Cobra II [by Michael Gordon and another military analyst, Bernard Trainor], indicates very, very clearly, and in fact, that is in fact what happened. We requested the 1st Cavalry Division. That was denied. At a very critical point in the war, I might say. 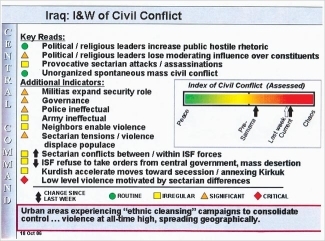 The metric that was established then was success against the Republican Guard and Saddam [Hussein]‘s forces when clearly the desired end state was what’s going to happen after the forces have been dealt with, and what do you do when you’ve got this military presence in Iraq. Clearly, the presence of more combat forces on the ground would have been needed.” [CNN, 4/16/2006] Later, during a Pentagon briefing of a gathering of military analysts, Rumsfeld will claim that he never denied any such troop increases, but that commanders such as Marks refused to accept additional troops (see Late December, 2006). 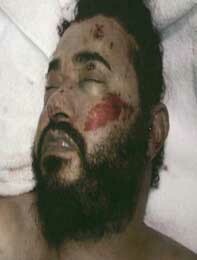 The dead Abu Musab al-Zarqawi. [Source: US army]Abu Musab al-Zarqawi, the supposed leader of al-Qaeda in Iraq, is apparently killed in a US airstrike north of Baghdad. There are contradictory details of what exactly happened in the airstrike, and three days later the Washington Post will report that “circumstances surrounding the killing [remain] cloudy.” [Washington Post, 6/10/2006] His killing is hailed by US and Iraqi officials as the most significant public triumph for US-allied forces since the 2003 capture of Saddam Hussein. For instance, Defense Secretary Rumsfeld calls him “the leading terrorist in Iraq and one of three senior al-Qaeda leaders worldwide.” The Washington Post calls al-Zarqawi the “mastermind behind hundreds of bombings, kidnappings and beheadings in Iraq.” [Washington Post, 6/8/2006; Washington Post, 6/10/2006] These pronouncements and media reports ignore a revelation made two months earlier by the Washington Post that the US military has been engaged in a propaganda campaign to exaggerate al-Zarqawi’s importance. The newspaper had reported that Zarqawi wasn’t behind nearly as many attacks as commonly reported (see October 4, 2004 and April 10, 2006). Even a Washington Post article about the propaganda surrounding al-Zarqawi published two days after his death will fail to mention any of the details provided in the Post’s original reporting on the campaign. 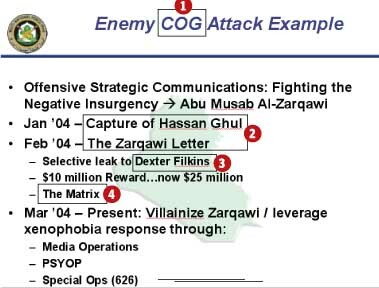 [Washington Post, 6/10/2006] Later in the month, an audiotape surfaces in which bin Laden supposedly praises al-Zarqawi as a martyr (see June 30, 2006), calling him a “brave knight” and a “lion of jihad.” US officials say the tape is genuine, however it should be noted that a letter from 2004 said to tie al-Zarqawi to al-Qaeda leadership is believed by many experts to be a US-government promoted hoax (see April 10, 2006). [Washington Post, 6/30/2006] Al-Zarqawi did pledge loyalty to bin Laden in 2004, but they don’t appear to have been closely linked before then and there even are doubts about how close their relationship was after that time (see October 17, 2004). Secretary of Defense Donald Rumsfeld, along with the chairman of the Joint Chiefs of Staff, General Peter Pace, and the commander of US forces in the Middle East, General John Abizaid, participate in a sometimes-contentious hearing with the Senate Armed Forces Committee (see August 3, 2006). The three then take part in a closed-door session with some members of Congress. After the two meetings, Senator Hillary Clinton (D-NY) calls on President Bush to accept Rumsfeld’s resignation. [New York Times, 8/4/2006] Rumsfeld will resign three months later (see November 6-December 18, 2006). A bipartisan Senate report finds that no credible evidence of any links between al-Qaeda and Saddam Hussein’s government ever existed, despite repeated and insistent claims by the White House and its allies (see Early 1995), March-June 1998, (2:40 p.m.) September 11, 2001, Shortly After September 11, 2001, September 18, 2001, September 19, 2001, September 21, 2001, October 27, 2001, 2002, February 6, 2002, March 22, 2002, July 25, 2002, September 12, 2002, September 15, 2002, September 25, 2002, October 1, 2002, October 2, 2002, October 7, 2002, October 7, 2002, December 2, 2002, Mid-January 2003, January 26, 2003, January 28, 2003, January 28, 2003, February 1, 2003-February 4, 2003, February 5, 2003, February 5, 2003, February 6, 2003, February 8, 2003, February 9, 2003, February 11 or 12, 2003, February 16, 2003, March 9, 2003, March 17, 2003, March 17-18, 2003, Shortly After April 9, 2003, July 9, 2003, September 7, 2003, September 14, 2003-September 17, 2003, September 28, 2003, December 17, 2003, January 8, 2004, January 9, 2004, Early June 2004, June 14, 2004, June 15, 2004, June 15, 2004, October 4, 2004, May 2005, October 2005, (2006), January 31, 2006, March 29, 2006, and September 10, 2006). Panel Democrats say that the White House knew the intelligence surrounding its claims of such links was flawed and unreliable. Tenet Admitted to Giving in to Pressure - They note that in July former CIA Director George Tenet told the panel that the White House pressured him to support its arguments and that he agreed despite the findings of his own analysts. “Tenet admitted to the Intelligence Committee that the policymakers wanted him to ‘say something about not being inconsistent with what the president had said,’” says Intelligence Committee member Carl Levin (D-MI). Such compliance was, in hindsight, “the wrong thing to do,” Tenet added, according to Levin. “Well, it was much more than that,” Levin says. 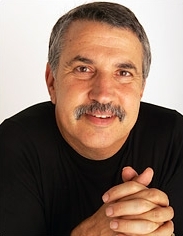 “It was a shocking abdication of a CIA director’s duty not to act as a shill for any administration or its policy.” Tenet also admitted that he erred in issuing a statement after President Bush’s October 7, 2002 speech saying that Bush’s claims were consistent with CIA findings (see October 7, 2002). Republicans Say Report Just 'Election-Year Politicking' - Republican committee members insist that there is little new information about prewar intelligence or claims about Iraq’s links to terrorism. Ranking committee member Pat Roberts (R-KS) accuses Levin and other Democrats of trying to “use the committee… insisting that they were deliberately duped into supporting the overthrow of Saddam Hussein’s regime.… That is simply not true, and I believe the American people are smart enough to recognize election-year politicking when they see it.” Democrats retort that the report speaks for itself. Impeachment Not Warranted - However, committee Democrats such as John Rockefeller (D-WV) say that the report does not prove any criminal behavior from Bush or his top officials, and say that impeachment of Bush or anyone else is not warranted. Hussein Opposed to US Policies - An FBI summary quoted in the report shows Hussein acknowledging that his government had met with al-Qaeda leader Osama bin Laden, but denying any collusion. Hussein said he opposed only US policies, and added that “if he wanted to cooperate with the enemies of the US, he would have allied with North Korea or China,” according to the FBI summary. How much has Congress appropriated for each of the three missions since the 9/11 attacks—Operation Iraqi Freedom (OIF), Operation Enduring Freedom (OEF, Afghanistan and other “Global War on Terror” operations), and Operation Noble Eagle (enhanced security for defense bases) for defense, foreign operations, and related VA medical care? How much has the Pentagon obligated on average per month for each of the three missions each year? What do trends in costs tell us about likely spending levels in the future? What is the estimated cost to reset—repair and replace war-worn equipment—and how might that funding affect the Pentagon’s regular or baseline budget? How are some types of war costs affected by policy and contracting decisions as well as operational needs and troop levels? How have deployed troop levels changed since the 9/11 attacks and how could Congress get accurate information on past and future troop levels? What is the average cost per deployed troop for OIF and OEF, and how might that cost affect future war costs? Multiple Prosecutions Underway - The Justice Department prosecutes four former supervisors for KBR, the large defense firm responsible for most of the military logistics and troop supply operations in Iraq. The government also prosecutes five executives from KBR subcontractors; an Army officer, Pete Peleti, has been found guilty of taking bribes (see February 20, 2008). 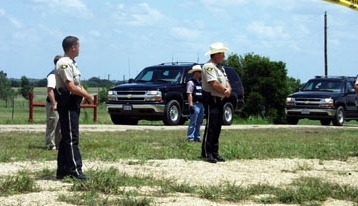 Two KBR employees have already pleaded guilty in another trial, and about twenty more people face charges in the ever-widening corruption scandal. According to recently unsealed court documents, kickbacks, corruption, and fraud were rampant in contractual dealings months before the first US combat soldier arrived in Iraq. Not only did KBR contractors receive handsome, and illicit, payoffs, but the corruption and fraud endangered the health and safety of US troops stationed in Iraq and Kuwait. One freight-shipping subcontractor has already confessed to bribing five KBR employees to receive preferential treatment; five more were named by Peleti as accepting bribes. Prosecutors have identified three senior KBR executives as having approved deliberately inflated bids. None of these people have yet been charged. Other related charges have been made, from KBR’s refusal to protect employees sexually assaulted by co-workers to findings that the corporation charged $45 for a can of soda. Pentagon Slashed Oversight - The overarching reason why such rampant fraud was, and is, taking place, prosecutors and observers believe, is that the Department of Defense outsourced critical troop support jobs while simultaneously slashing the amount of government oversight (see 2003 and Beyond).